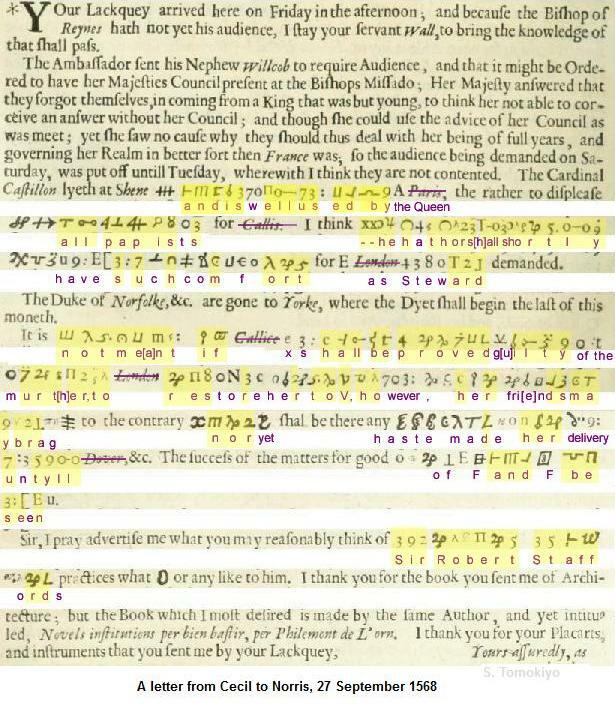 Some aspects of cryptology during the reign of Queen Elizabeth I are described as far as can be known from publications readily available. The well-known cipher of Mary, Queen of Scots at the time of the Babington Plot (Wikipedia) is not discussed herein. Let it suffice to say it substitutes non-alphabetical symbols for letters of the alphabet and some frequently used words. Nicholas Wotton served as ambassador in France intermittently under Henry VIII, Mary I, and Elizabeth I. 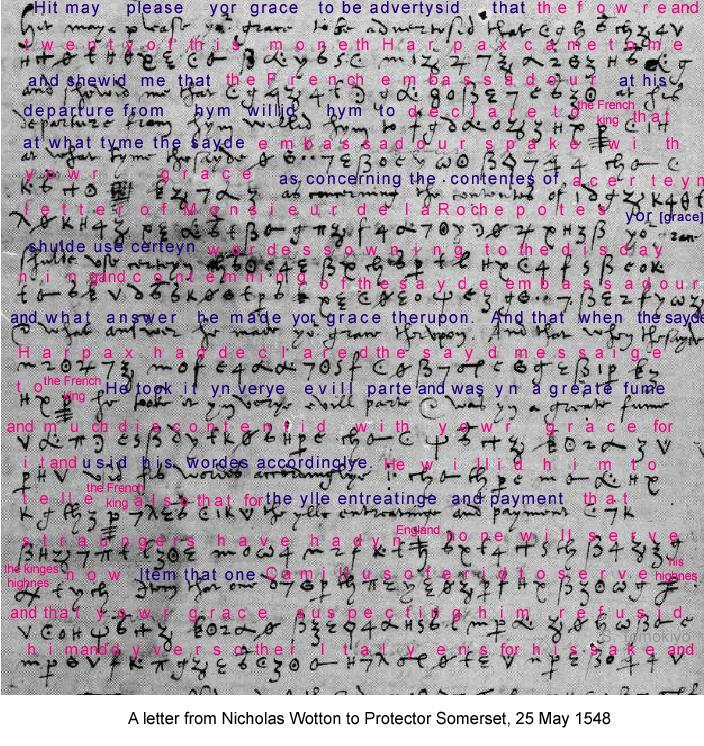 The following shows a cipher used shortly before the Elizabethan age in a letter from Wotton to Protector Somerset dated 25 May 1548, printed in Secret Writing. As was typical in the sixteenth century, the cipher is based on substitution of non-alphabetic symbols for each letter of the alphabet. To make codebreaking more difficult, each letter might be represented by more than one symbol. Some frequently occurring words (e.g., "and", "for", "the French King", "England") as well as double letter "ll" are assigned special symbols of their own. Wotton used cipher in writing to Secretary Petre or the Queen in his embassy in Mary's reign. When his predecessor Sir William Pickering (biography), suspected of involvement in Wyatt's Rebellion in early 1554, fled England to live openly in Paris, Wotton was so alarmed to propose to replace a cipher. Because Pickering has long been in possession of the cipher used by Wotton, and is now here, begs him to consider whether there be any danger therein, and if so, to provide for it as he shall think good. In case his letters should be intercepted, as is very probable, sends a new cipher for approval; if it is not liked, he will continue to use the present one. Early in her reign, Queen Elizabeth already used a private cipher, which appears to have been a relatively simple one. The details are not known to the present author. Uses this cipher as stronger than the Queen's private cipher. The Queen appears to have kept her own cipher. In a letter to the Queen dated 25 February 1588 mentioned below, Stafford, ambassador in Paris, wrote in Burghley's cipher from fear she might have lost her own. (CSP, Foreign, Elizabeth, xxi). William Cecil, Secretary of State, routinely used cipher with various correspondents. Nicholas Throckmorton (an uncle of the conspirator Francis Throckmorton), ambassador in France from May 1559, was one of them. He occasionally had some intercepted letters deciphered by Somer (see below) and sent back the decipher after re-enciphering it in his own cipher. In September 1562, he was caught in an action of the Admiral (see below) when travelling and lost everything including his cipher. In the end, the cipher was recovered but he recommended change of the cipher. The writer has barely escaped with his life. Through the Prince he has recovered part of what he lost. He does not think his cipher fell into any man's hand, but it should be changed, and another sent by Cecil's next despatch. Throckmorton wanted to be recalled and Sir Thomas Smith, was sent to France from 1562 to 1566. Smith used his own cipher. Smith's cipher, different from Throckmorton's, was delivered after his departure. Has not received his cipher, which he should have before he leaves Dover. This day (22nd Sept.) at 7 a.m. received Smith's letter of yesterday that he had not the memorial or the cipher. On Sunday night they were delivered at his [Smith's] house in London. In December 1562, Throckmorton was present in the camp of the Protestant army under the Prince of Condé, when the latter was defeated by the Duke of Guise commanding the Catholic forces and was caught a prisoner. This time, the situation was more serious than before for Throckmorton. He not only lost his train and baggage but was placed under house arrest for some time. Notwithstanding, his letters of 6 and 13 January and 1 March 1563 to the Queen were partly enciphered. A small portion of Smith's letter in cipher (CSP) is printed in Rees' Cyclopaedia. While arabic numerals are used, they are merely part of symbols of the cipher alphabet. Numerical codes are not in use and frequently used words are instead represented by symbols, which often retain the initial letter of the words they represent. It appears symbols can be put in any orientation (e.g., those for "b", "c", "l"), as in the case for the Cecil-Norris cipher (1568) below. Code names for representing persons were widely used in the Elizabethan era, as detailed in Butler (p.132-133). An elaborate code of 1563 in the hand of Cecil, includes "tout" (Queen Mother of France), "rien" (Charles IX), "balaams" (Neutrals), "petit" (Prince of Conde), "compère" (Constable Montmorency), "seul" (Coligny), "ensemble" (D'Andelot) and "courtisan" (Cardinal). A cipher for Scotland in 1592 represents Sir Robert Melvin, the elder and the younger, as "Meshech" and "Kedar." Other examples will be mentioned below. A small portion of a letter in cipher (CSP) from Thomas Chaloner, ambassador in Spain, is printed in Rees' Cyclopaedia. This is similar to Smith's cipher above in that the symbol for "e" is placed in various orientations and that code symbols for "to" etc. carelessly remind of the initial letter of the referent. As early as 1560, one John Somer was active as a decipherer. He had served as secretary under Nicholas Wotton, ambassador in France, during the reign of Queen Mary (CSP, Foreign, Mary in passim). Apparently, after the accession of Elizabeth I, he continued his service for ambassadors Throckmorton and then Smith. In the spring of 1560, Throckmorton received from Secretary of State Cecil an intercepted letter in cipher addressed to Mary of Guise, mother and regent for Mary, Queen of Scots, from the Duke of Guise and the Cardinal of Lorraine (brothers of Mary of Guise) and had it deciphered by Somer (probably, SP53/23 no. 8). He rewrote the letter in his own cipher, with further disguise by intermeddling "divers English words", and returned it to Cecil (Throckmorton to Cecil, 6 April 1560 (CSP, Foreign Elizabeth ii); cf. Lord James Stewart to Norfolk, 18 March 1560 ibid.). Similar deciphering was reported on other occasions (Throckmorton to the Queen, 11 April 1560 and Throckmorton to Cecil, 12 April 1560 (ibid. ), Throckmorton to the Queen, 25 April 1560ibid. ), Throckmorton to Cecil, 7 June 1560, CSP, Foreign, Elizabeth, iii), Throckmorton to Sir William Petre, Blois, 7 June 1560 (Cecil Papers)). Putting the deciphered message into his own cipher is a precaution in order to prevent the enemy from finding out the fact of deciphering in case the letter is intercepted. Such a precaution appears to have been followed by Smith (Smith to Cecil, 12 March 1563, CSP, Foreign, Elizabeth, vi). He [Cecil] sends an intercepted letter from a French secretary in the castle to the town. If Mr. Hampton can do nothing with it, it should be sent to Mr. Sommer. Cecil would have given 100l. to have had Somer here. Asks Mr. Hampton to take the care to send these letters to Throckmorton. The death of the Queen Dowager on 11 June cleared a way to an agreement by a treaty on 5 July (Treaty of Edinburgh) that both the English and French troop leave Scotland. Despite the precaution taken by Throckmorton, their deciphering activities could not go unnoticed. In May, Throckmorton had pointed out their "wonderful intelligence that the Queen Dowager has of the doings in England, as appears by her letters of the 1st May, who has got knowledge that her letter and the French have been deciphered, whereupon will follow an alteration of all their ciphers." (Throckmorton to Cecil, 22 May 1560, CSP, Foreign, Elizabeth iii) The "letters of the 1st May" mentioned would have been something similar to the following. Indeed, Somer soon had to tackle a new cipher. Returns them the letter in cipher, deciphered, The characters are new and difficult. Notes in it a declaration of the French meaning for protracting of time, and no disposition in them to have fallen to appointment but by constraint; also the dangerous intelligence they have how their letters have been deciphered. Mr. Somers' great travail and good service declares itself worthy recompence. Prays that they may be endued with God's Holy Spirit. In 1569, Somer's activity was also known to the Spanish. He refused to return my packet, and these folks are getting a certain Somers to decipher the letters. Occasionally, Somer directly wrote to Cecil in cipher (Somer to Cecil, 9 February 1563 CSP, Foreign, Elizabeth, vi). At the top of this letter, Somer wrote "Because it would be too much pain for you to decipher this yourself, I pray you that Mr. Allington may do it closely." The intercepted French letter mentioned above, which was from a person in Edinburgh Castle and addressed to d'Oisel, representative of France, in Leith (Wikipedia), shows the French were not only aware of codebreaking by the English but also thought of taking advantage of it to plant deceptive information. Because the enemy have the King's cipher, if D'Oysel thinks good to give any ciphered advertisement and let the same fall into their hands, they will not miss to decipher it, and finding therein the state of the place such as he pleases to make it, it may be somewhat beneficial to the negociation of the said Randan and the Bishop, who greatly desire to know truly for how long he yet has victuals. The reign of Queen Elizabeth coincided with a series of religious wars in France between factions backed by powerful aristocratic houses. The Catholics were led by the House of Guise (including the Duke of Guise and his brother Cardinal of Lorraine, who were uncles of Mary, Queen of Scots, consort of the deceased brother Francis II of King Charles IX), while the Protestants were led by the House of Bourbon (in particular the Prince of Condé after the death in 1562 of his brother, Antoine of Navarre, father of Henri de Bourbon, later Henry IV) and Admiral Coligny. Although Catherine de' Medici, regent and mother of the boy king Charles IX, was a staunch catholic, she sought to take advantage of the Protestant party to counterbalance the overmighty Guises. During the first war (1562-1563), the Huguenot leaders were allied with England. will inform him by the writer. Smith also prepared a cipher himself for his correspondents of the Protestant party in France. Apparently, Henry Killigrew, who was sent to Heidelberg in 1569 to negotiate with the Elector Palatine cooperation for intervention in the civil wars in France, may have shared his cipher with the elector. When Walsingham, Secretary of State after Cecil, offered his services and desired to know his pleasure as to how he should communicate with him in January 1571, the elector proposed use of Killigrew's cipher. Accepts and thanks him for his offers of assistance in preserving the mutual intelligence between himself and the Queen of England, and recommends that Killigrew's cipher should be used in their correspondence. Walsingham was given a cipher by Frederick Schwartz de Ruissingen, a servant of Gebhard Truchsess, who became Archbishop-Elector of Cologne in 1577 but triggered a war in 1588 by his conversion to the reformed faith and marriage with a Protestant woman (Wikipedia). Desires to know if Walsingham still has the duplicate of the cipher which he sent to him at Antwerp six years ago, in which case he can write freely. In 1589, Schwartz suggested using the same cipher (Capt. Frederick Schwartz of Ruisingem to Walsingham, 9 January 1589 (CSP, Foreign, Elizabeth, xxiii)). England supported the Regent government of Scotland under boy king James VI, while his mother Mary, the deposed Queen of Scots was captive in England since 1568. The Earl of Morton, Regent of Scotland from 1572 to 1578 even shared a cipher for correspondence with Walsingham. A cipher was also provided to the Prince of Orange, leader of the Dutch Revolt against the Spanish crown. After the rebellious and loyal provinces made an agreement in the Pacification of Ghent in 1576 to drive the mutinous Spanish troops out of the Netherlands, the Prince of Orange asked England's influence towards the departure of the Spaniards. In conveying that the Queen was "a good ally and neighbour," the Earl of Leicester provided the Prince of Orange with a cipher. Queen Elizabeth appears to have been provided a cipher from the King of Sweden. Her further pleasure is that you should thank Allard, servant to the King of Sweden for the offer of his service, and acquaint him with the mishap that has befallen her Majesty in losing the cipher he sent her, which by oversight of one of her maids was burnt among certain other waste papers; wherefore she desires another. Henry Norris served as ambassador in France from the autumn of 1566 to August 1570. He used cipher in writing to William Cecil, Secretary of State, at least from 21 February 1567(CSP) to 25 July 1570(CSP). Cabala (1663) reproduces symbol ciphers used by Cecil in writing to Norris from 3 November 1567 (p.142) to 23 March 1570 (p.173). By "a pleasant mistake of the editor" (Davys p.42), the "Postscript" to the letter of 27 September 1568 printed in Cabala (see the image below) is actually a decipherment of the passages in cipher. This allows us to identify the values of the symbols. The partially reconstructed cipher table is as follows. It appears a symbol may be written in any orientation to encipher the same letter. Further, a single alphabetical letter is used to represent some proper names such as "A" representing "the Queen" and "x" representing "the Queen of Scots", while place names such as "Paris", "London", and "Callice" are all insignificant (Davys p.41). It appears abbreviation was also used in enciphering (see "of the" and "delivery" in the image below). The reconstructed cipher above allows us to identify some words such as "Monmorency" and "Sir Robert Stafford" in passages in cipher of the other letters. It is noted that the first of these letters of 3 November 1567 (p.142) includes a passage "42 91 11 f Π", where "f" and "Π" are approximate letters for cipher symbols, but probably this does not represent a numerical cipher as was common in Italy but a coincidental occurrence of number-like symbols. When d'Andelot, an ally for the English, was surprised and defeated on his way to the Prince of Condé, Norris recommended change of their cipher (Norris to Cecil, Paris, 25 September 1568, CSP, Foreign, Elizabeth, viii). Cecil's letter of 1 October 1568 (p.154; see also p.155, 161) refers to change of cipher. The new cipher also seems to use symbols rather than Arabic numerals. The decipherer Somer was still relied on in 1570s when letters concerning Mary, Queen of Scots were intercepted. Mary had been deposed in 1567 in favor of her son residing in Stirling. While she lived as a captive in England, where she had sought protection, she still had supporters, including her ambassador in France, Bishop of Glasgow (Wikipedia). Early in 1573, the Castle of Edinburgh openly defied the new government in support of Mary and William Maitland of Lethington (Wikipedia) was one of the party. England backed the regency under the boy king (then seven) and assisted the government to reduce the Castle into surrender in May. The intercepted letters of Mary's party were first sent to the court at Stirling for deciphering. When it did not succeed, one of the letters was forwarded to England to be attacked by Somer. There be at Stirling, yet undeciphered, two letters from Lethington to the Bishop of Glasgow, and one to John Chisholm; .... If the King's master cannot decipher them, he trusts he shall have them to see what Mr. Somers can do with them. The letters sent to Stirling to be unciphered are not come back. In the spring of 1577, Somer, now one of the Clerks of the Signet (CSP, Foreign, Elizabeth, xi), substituted for the Secretary Walsingham during his illness. At about the same time, another, more renowned codebreaker, St Aldegonde, was active in the Netherlands and occasionally supplied deciphering to England (see another article). Wilson, ambassador in Flanders, wrote to Somer his appreciation of St Aldegonde's skill. Is glad he is in the place of the Secretary now in the time of his sickness, and if he were joined with him would think the Queen had made a good choice. If St. Aldegonde had the original letters in cipher he sent to the Secretary, instead of the copies he made himself for him, he would easily explicate all things. Deciphering in England was relied upon by a foreign ally, Don Antonio (Wikipedia), claimant of the Portuguese throne since the crowning of Philip of Spain as King of Portugal in 1581. Don Antonio was last night with me and gave me some letters in cipher from Bernardin de Mendoza to the Prince of Parma and La Motte, which he cannot decipher, and so wishes to be sent to you to be deciphered and shown to her Majesty, praying that then you would send them back, with what you have "picked out of them." There were others with deciphering skills. One was Thomas Randolph, an English agent at the court of Scotland. Another was Knevet, recruited by Walsingham and sent to William Davison, an English agent in Flanders. P.S. I send herewith certain letters which I intercepted this last week coming out of Spain, two of them being of some importance Mr. Knevet has taken some pains to decipher. Six months later, the ambassador Wilson mentioned a young talent in Paris. Thomas Phelippes is known for breaking the cipher of Mary, Queen of Scots during the Babington Plot in 1586. Deciphers of Spanish letters in 1584 by an agent (Angel Angeliny) in the Low Countries (CSP, Foreign, Elizabeth, xviii, ibid.) as well as one of the Spanish ambassador in London, Mendoza, (ibid.) are in the hand of Phelippes. A cipher used by Walsingham in 1574 (Folger Shakespeare Library) is similar to the Cecil-Norris cipher above. Amias Paulet, appointed ambassador in France in 1576, reported to Burghley and Walsingham separately. He appears to have considered the cipher provided from Walsingham insufficient and asked Walsingham additional codes for some names. Afterwards, he recommended replacement of the whole cipher provided by Burghley. It may please him to remember La Noüe is not in his cipher. It may please him to send him a cipher for the King of Spain, the Queen of Scots, some of the Princes of Germany, and some of the King's Council here. PS. I fear to commit anything to your Lordship's cipher, and therefore please provide me with a better. I have been bold to use it at present, because I do not think the time to be very dangerous. Change of cipher during Cobham's embassy in Paris is known (CSP, Foreign, Elizabeth, xvi). Sir Edward Stafford, ambassador in France from October 1583, used different ciphers in reporting to Walsingham and Burghley (CSP, Foreign, Elizabeth, xviii). His alignment with Burghley rather than Walsingham caused complications of loyalties in Walsingham's intelligence network and even his letters were intercepted by Walsingham's agents (Wikipedia). As with Paulet, he made additions to Walsingham's cipher. I have sent you some names to add to your cipher which were forgotten. A small portion of Stafford's letter in cipher (CSP) is printed in Rees' Cyclopaedia. In a letter of 25 February 1588 to the Queen, reporting a secret meeting with the King of France (Henry III), he said he wrote in Burghley's cipher from fear she might have lost her own. It was Walsingham, however, who inserted the decipher above each of the cipher words presumably for the Queen's viewing. (CSP, Foreign, Elizabeth, xxi). A page from this letter is reproduced in Pryor (2003). (It is also found on the National Archives website.) It can be seen that the cipher includes numerical codes such as 66 (King of Navarre), 74 (Queen Mother), 77 (King of France), 79 (Queen Elizabeth), 100 (Spain), 109 (France), 111 (England) as well as non-alphabetic symbols to spell words and names and a special symbol for Pinard, French Secretary of State. Cobham was one of the peace commissioners sent in February 1588 to Flanders to negotiate a peace between England and Spain. England had been supporting the Dutch revolt against Spain by sending the Earl of Leicester as Governor-General but military fiascoes had led to an irreparable breach between the English and the Dutch by the end of 1587 (Wikipedia). A list of code words for Lord Cobham, dated 25 May 1588, is described by Butler. The list contains several pages of substitution words which begin with the same letter as the first letter they stand for. For example, "thankful" substitutes for "traitorous"; "such" for "suborn"; and "weight" for "war." On the other hand, names are represented by just arbitrary words that may not begin with the first letter of word they represent. For example, "Beware" stands for the Pope; "Doubt" for the Emperor; "ferret" for Robert Parsons; "weasel" for William Creighton, a Scottish jesuit; "Anania" for Queen Mother of France; "Achitophel" for the Duke of Guise. A variety of this cipher includes "visus" (Burghley), "oculus" (Lord High Admiral), "auditus" (Earl of Leicester), "aures" (Francis Drake), "olfactus" (Mr. Secretary), and "nares" (Lord Henry Seymour). Henry Unton's cipher when he was English ambassador in France in 1591 was similar to Thomas Bodley's cipher in 1588 in that it consisted of alphabetical letters, figures, and arbitrary symbols (Daybell p.156). In 1584, Walsingham provided a cipher to George Gilpin, secretary of the Merchants Adventurers at Middelburg. I received yours of the 14th by Mr. Edmond Yorke, with the cipher, which I will use as occasion requires. On Friday was sevenight, I received your letters with the enclosures, which for five days I could not look at, nor will my memory yet serve to answer, especially that set down in cipher, which seems to differ from the cipher sent me, wherefore I pray to be more particularly informed thereof. The cipher employed numerical codes such as 30 (King), 50 (the Queen), 60 (England), 70 (France), 92 (Holland), 93 (Zeeland), 96 (troops), 200 (Count Maurice), 202 (the Admiral of Zeeland), 204 (Flushing), whereas the letter cipher consisted merely in "turning the alphabet the other way round" (CSP, Foreign, Elizabeth, ixi) (presumably meaning that "A" is enciphered as "Z", "B", as "Y", "C" as "X", etc.). A cipher, dated 28 November 1588, for Thomas Bodley, is known (online). The diplomat, who may be better remembered today for reestablishing the Bodleian Library, Oxford, was sent as a minister to the Hague in 1588, where he stayed until 1596. The letters of the alphabet are each assigned a symbol, including Arabic numerals 12-20. The letters "a", "e", and "p" are designated as nulls and other letters represent high-frequency words (e.g., "p" and "q" representing "the" and "that", respectively). Capital letters A-V represent country names and non-alphabetic symbols (including "30", "40", "50", and "70") represent personal names and titles. Towns in the Low Countries are represented by disguise names (e.g., "Paris" representing "Utrecht") or Arabic numerals 21-100 and 200. Thus, Arabic numerals are used but only as one of a variety of symbols. Butler (p.133) also observes "numerals are freely used for proper names" during this age. On the other hand, apparently a cipher was not established with Burghley until late 1590, when Bodley asked Burghley to send one (DCB/001/HTML/0267/008, DCB/001/HTML/0270/008, DCB/001/HTML/0271/008). According to Butler (p.131), a cipher sent to Bodley in 1590, written by Lord Burghley himself, used signs of the zodiac: Duke of Parma (Aries), Count Mansfeld (Taurus), Count Maurice (Gemini), States-General (Cancer), Council of State (Leo), Sir Francis Vere (Aquarius), and so on. A code for an envoy in France in 1591 again used signs of the zodiac scheme(: Queen of England (Aries), King of Spain (Scorpio), Virgo (Normandy)) as well as days of the week(: French ambassador (Sunday), Duke of "Mercury" (Monday), soldiers (Tuesday), and victuals (Saturday)). In 1599, Henry Neville was appointed ambassador to France. In May 1600, Neville went to Boulogne for negotiations with Spain. (Of the two allies for the Dutch struggle for independence from Spain, France had made peace with Spain in 1598 but England had not.) The talk was soon broken and Neville returned to England. 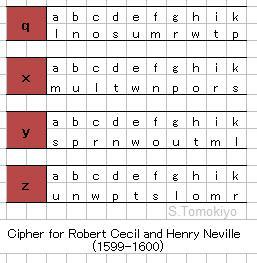 During his embassy in Paris, Neville used cipher in correspondence with Robert Cecil, son of Lord Burghley and now Secretary of State. The cipher is based on pairing of letters (Davys p.42). It consists of four tables of pairing of letters and the letters "q", "x", "y", and "z" are reserved to indicate a table. When the "q" table is selected, for example, the letters "a" and "l" are paired and a plaintext letter "a" is enciphered as "l" and a plaintext letter "l" in turn is enciphered as "a". Change of tables may occur in the middle of a word. Thus, the following sequences both read "the Patriarch." The following codes are also used. During Neville's absence, his assistant, Ralph Winwood, served as resident in Paris and later officially succeeded Neville in 1601. 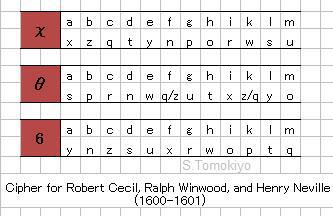 Winwood used a cipher similar to the above, first with Neville and then with Cecil. One notable difference is use of "χ", "θ", and "6" as indicators of pairing tables, which allows letters "q", "x", "y", and "z" to be enciphered. There appear to be two schemes for codes. One is numerical codes such as "105" (England), "124" (Spanish ambassador), "125" (ambassador of Florence), "126" (ambassador of Venice), "144" (the French King) and the other is substitution words such as "Health" (England), "Wisdom" (Spanish ambassador), "Advise" (ambassador of Florence), and "Respect" (ambassador of Venice). A cipher based on pairing appears to have been used in a letter from Henry Ogilvie, Laird of Powrie to Walsingham, written early in December 1588 (CSP, Foreign, Elizabeth, xxii). Another source says Wotton's cipher included 29 (war), 39 (England), 43 (Genoa), 55 (the Queen of Spain), 67 (ammunition) (James Westfall Thompson and Saul K. Padover, Secret Diplomacy, p.260). One interest in the study of ciphers of this period is in transition from arbitrary symbols to Arabic numerals. While exotic symbols may look enigmatic at a first glance, it is also difficult to handle for enciphering and deciphering (though the additional labour for writing such a symbol was much less than today, when our writing is limited by a computer keyboard). It would be difficult to manage more than a hundred such symbols, while one can use as many different figures as required. However mysterious symbols may look, the same security can be achieved more easily by figures. In Italy, which was leading in cryptology, figure cipher was common in the mid-sixteenth century. The Spanish ciphers in the latter half of the sixteenth century still used a mixture of Arabic numerals, alphabetic letters, and arbitrary symbols to encipher letters of the alphabet (see another article) and it was in the late seventeenth century that figures replaced symbols (see another article). In the Elizabethan England, apparently, it was predominantly symbols rather than figures that were used for spelling letter by letter. For codes representing words or names, figures were beginning to be in common use, as exemplified by ciphers used by Sir Edward Stafford mentioned above. Other than these, a report by one Jacques Rossel in Antwerp to Walsingham in 30 November 1578 (CSP) includes ciphers 15 and 20, which are said to represent Count Bossu and Duke Casimir of the Palatinate (CSP). Audley Danett (biography), secretary to John Norris in command of the English troops in the Netherlands and a regular correspondent for Walsingham, also used a numerical cipher for representing names in 1582 (CSP, Foreign, Elizabeth, xvi). A letter from Lord Buckhurst (Thomas Sackville, sent to the Netherlands) to Walsingham dated 18 June 1587 used "40" for the Earl of Leicester (CSP). A cipher which "for the most part consists of figures which run on without a break" and thus could not be deciphered completely is recorded. It is a letter from Francis Hartley (Gifford) to M. Wilsdon (Phelippes) enclosed in a letter from Stafford to Walsingham from January 1588 (CSP). Numerical ciphers are said to have been already popular in the early seventeenth century. (Daybell p.156) Henry Wotton's ciphers with his fellow ambassadors were entirely numerical (Daybell p.157). One definite piece of evidence of English figure ciphers for individual letters might be that of August 1619 used in Sir Isaac Wake's letter from Turin, Italy (Cabala p.392; Davys p.44). It is a regular assignment as follows. Figures followed by an alphabetic letter are codes. Astle (1784), The Origin and Progress of Writing (Google), Plate facing p.176 seems to be the source of the article in Rees' Cyclopaedia. SP 53 at the UK National Archives has subseries SP 53/22 and SP 53/23, which include "Ciphers, including those for papers seized at Chartley Castle on the discovery of the conspiracy in 1586 which were used, when deciphered, to implicate Mary and bring her to trial." SP 53/18/55 has Babington's record of the cipher used (Wikipedia). See another article for French ciphers during the reign of Henry II of France. *Those deciphered during the reign of Queen Elizabeth are also given numbers of their own sequence. So "no. 7" is also given "no. 1". no. 34 (1573) Cipher between Lethington [Liddington] (Wikipedia) and Grange (Wikipedia) and a secretary of theirs sent into France for aid a little before Edinburgh castle was besieged. First posted on 17 March 2012. Last modified on 5 February 2019.